I hope you're all having a great week so far! 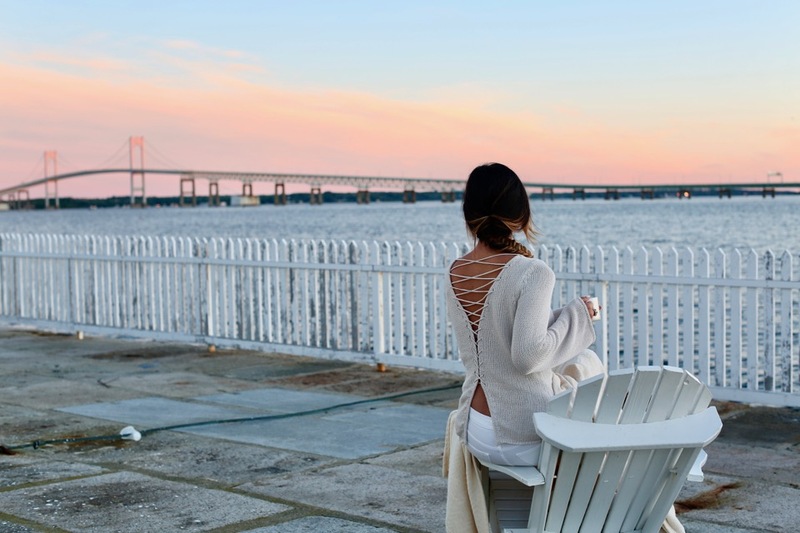 Today, I'm excited to share a few of our favorite 'must-see' spots from our trip to Newport, RI. The minute we arrived, we took an Uber straight to Goat Island, home of the new Gurney's Newport. Until about 3 months ago, this hotel was an old, run down Hyatt. Since Gurney's has taken over, they've completely transformed (and are still transforming) the space into the perfect mid-century, boutique resort right beside the water. 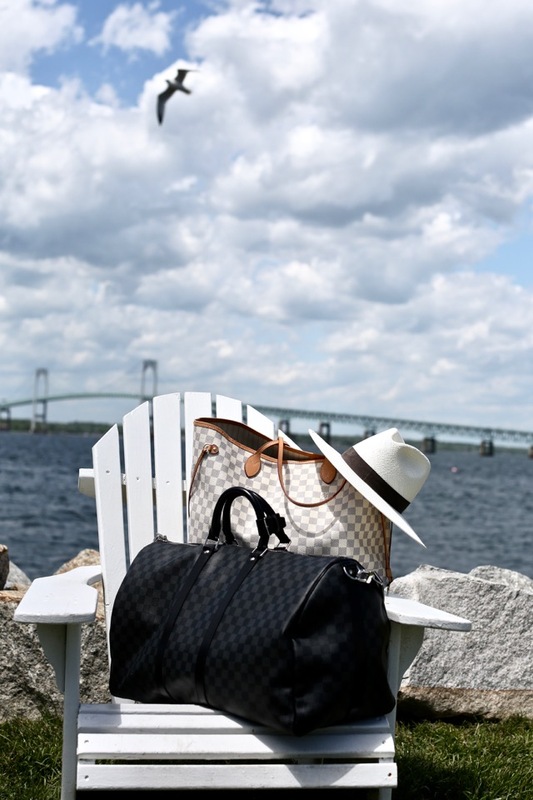 On Goat Island, you're surrounded by the Newport Harbor and Narragansett Bay which feels really private and off the beaten path. 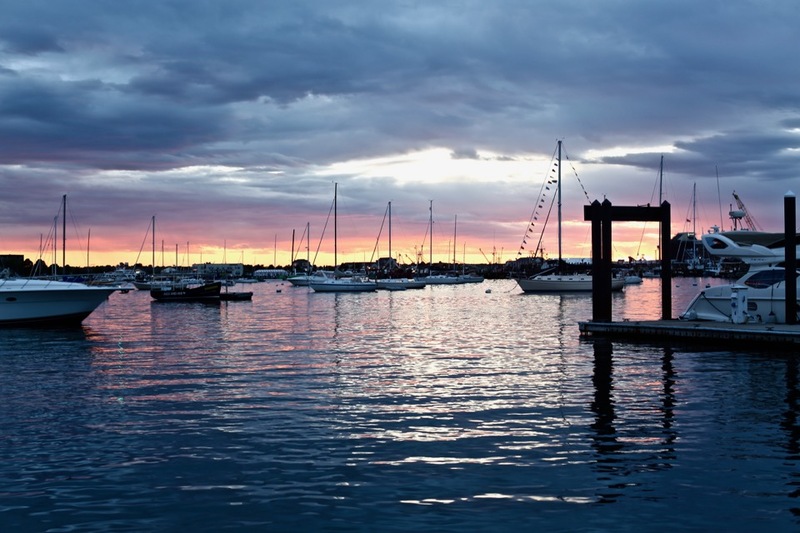 However, you're only minutes away from downtown Newport, giving you the best of both worlds. The resort is still undergoing a bit of construction, but without a doubt, they're improving the rooms, restaurants, and spa each day until it's absolute Gurney's perfection! The Pineapple Club (waterfront) restaurant and Scarpetta, our favorite Italian EVER, are already open on the property and definitely have to make your list. Meanwhile, the 360-degree water views from anywhere at the resort are absolutely stunning and Goat Island is the perfect 'City in the Sea' location. Shortly after checking in, we drove up the coast to Castle Hill for 'lunch on the lawn'. They have a beautiful outdoor area, perfect for dining by the water, and the food is amazing. 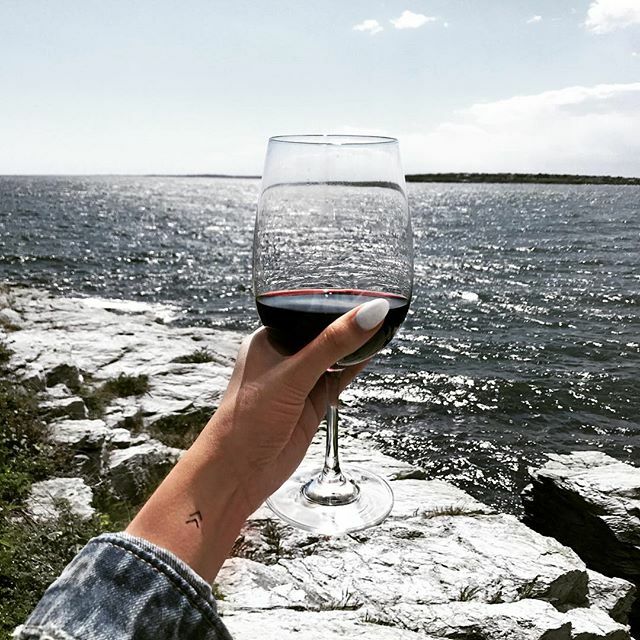 We immediately ordered a bottle of red wine and lobster rolls, because #bestlife. It was a bit chilly by the water, so the restaurant actually brought out blankets for us! This lunch, these views, and my favorite travel partner by my side made for one amazing first day in Newport. Later that evening, we had dinner reservations at The Spiced Pear, located inside The Chanler hotel. It was by far, one of the best meals we've ever had! Everything from their cocktails and appetizers to the main course and dessert, we never wanted to leave. Get the 'French Pear Martini' and thank me later. The sunsets in Newport were like no other. We constantly kept checking the time to make sure we had a front row seat each night to watch the magic happen. 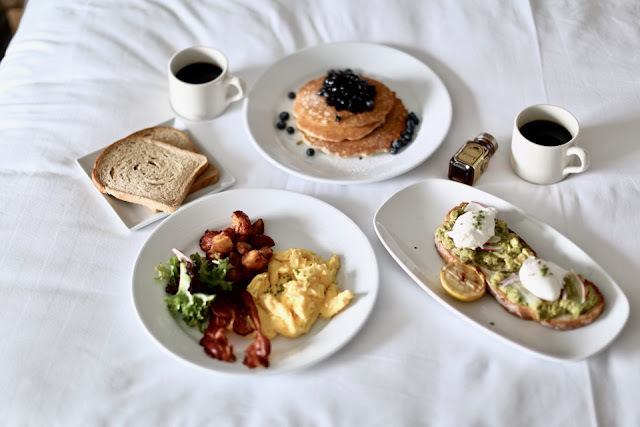 Moving on to breakfast in bed - seriously, who does NOT want their breakfast wheeled in and set up perfectly in front of you each morning? Gurney's room service was THE best. Other than the delicious breakfast, they also delivered a bottle of my favorite, Veuve Clicquot to our room and a charcuterie board each day. The staff and service at both Gurney's locations are top notch. Whether you're in the heart of downtown Newport or decide to stay close to the resort on Goat Island, there are SO many things to do. As most of you know, we live our best life by the water, so we decided to take a boat out and see the city from the sea. 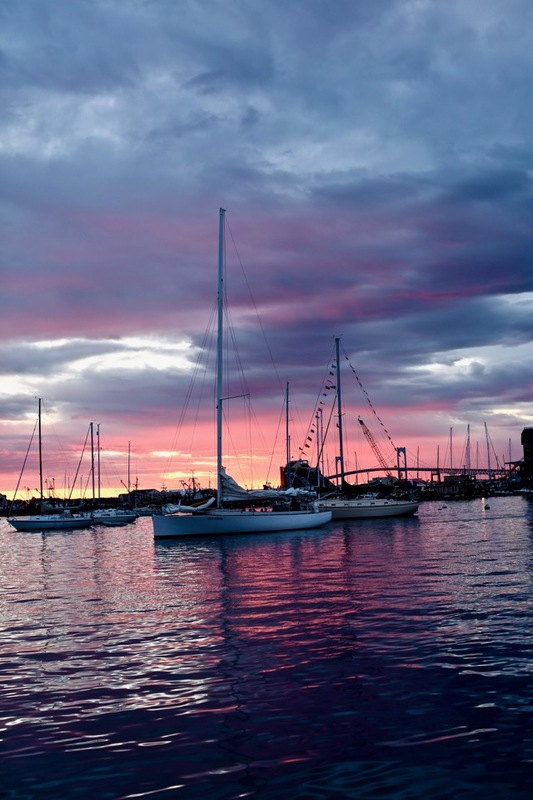 The Antique Yacht Collection is a private charter that is worth every single penny. Greg and Alana (boat owners) picked us up right outside of our room on the Gurney's dock and we headed out to explore! 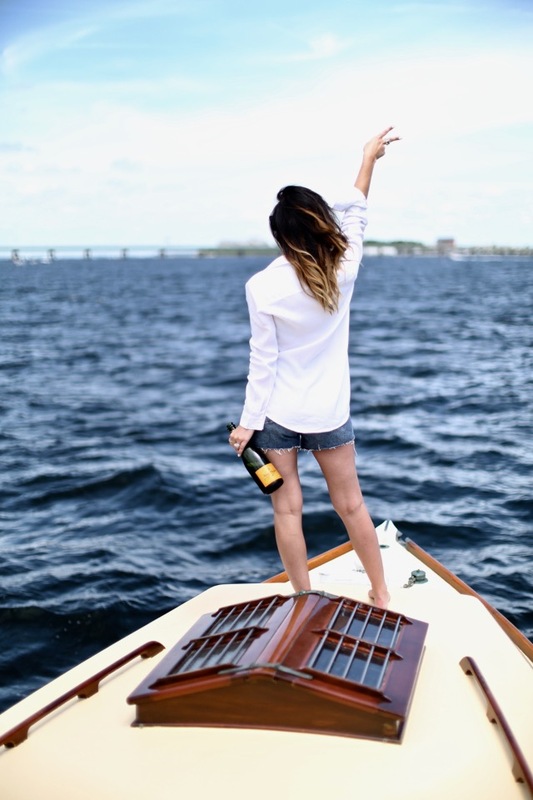 With Veuve Clicquot in hand and the stunning views surrounding us, it was definitely one of our favorite things we did while in Newport. 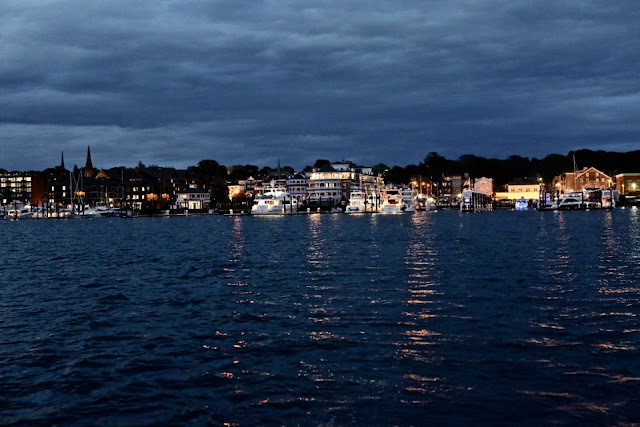 If you have a chance to see Newport from a yacht - do it. Another fun thing we did was mansion hopped on Bellevue Avenue. The Bellevue Avenue Historic District is located along and around Bellevue Avenue in Newport, Rhode Island. Its property is almost exclusively residential, including many of the mansions built by affluent summer vacationers in the city around the turn of the 20th century, including the Vanderbilt family and Astor family. This photo was taken outside of the Marble House, built and once owned by the Vanderbilt family. The self-guided tour was so informational and the history that fills each room is beyond amazing. Last, but definitely not least, I have to talk about the sunrise. Two out of three mornings, we pulled ourselves out of bed and headed to the lighthouse (on the Gurney's property) and watched the sunrise over the bridge. It was breathtaking. Worth every minute of lost sleep and started our days off in the best possible way. Gurney's Newport, you were one for the books and we can't wait to come back and visit again soon! LOVE! 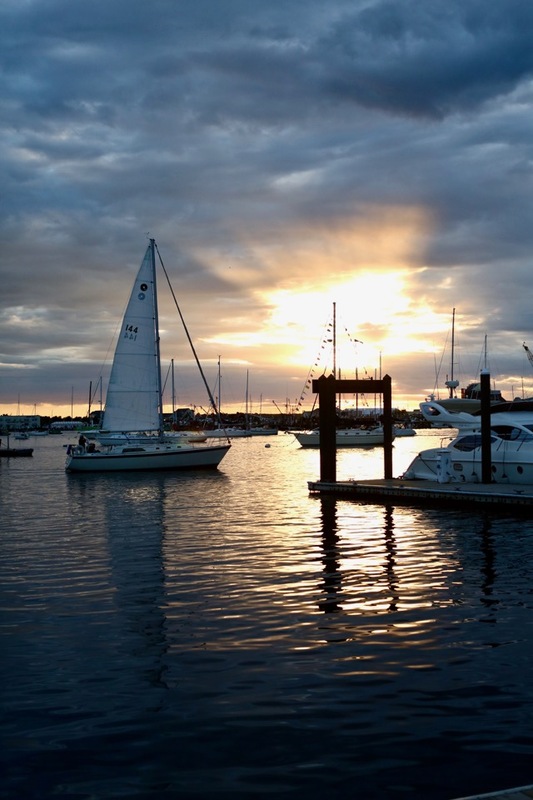 Newport is such a gorgeous destination! Beautiful pictures - sounds like a lovely place! Awesome shots! I love reading about your amazing vacay! I'm headed to Gurney's Newport in 3 weeks! I was a little worried when I heard about the ongoing construction, but the resort assured me it would all be completed by the end of the month. Last time I went, it was for my bachelorette party... this time, I'm headed back married with 2 kids. Slightly different kind of getaway! Your trip looked gorgeous! I'm definitely going to look into that private charter! Everything looks so wonderful! Beautiful photo diary! Love Newport =) This is a little off-topic, but how has your LV in the Azure held up? I've heard horror stories about denim or other things staining the canvas. Love that white slip dress! thank you for your sharing this nice picture I really like this post !